Traditional Greek Tzatziki sauce with cucumber, dill and mint! Make a bigger batch, Tzatziki Sauce disappears fast! 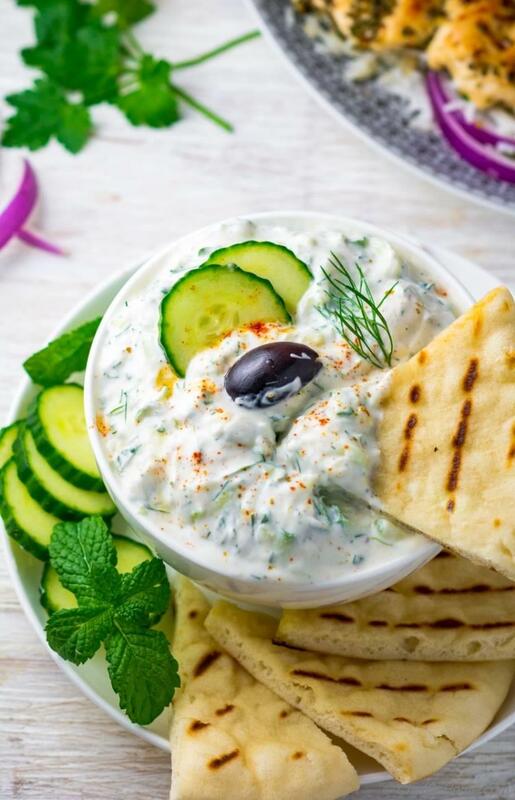 Flavorful and easy Tzatziki sauce, a Greek yogurt and cucumber sauce with traditional tzatziki seasonings - garlic, cumin, black pepper, lemon, and fresh herbs. If you have never tried Tzatziki? then this yogurt sauce is must try! It needs less than 10 minutes to make a big batch! 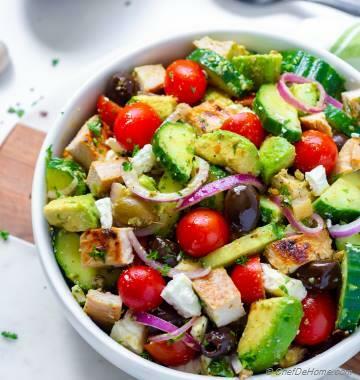 It is also healthy, gluten free, carb-free, and very refreshing side! 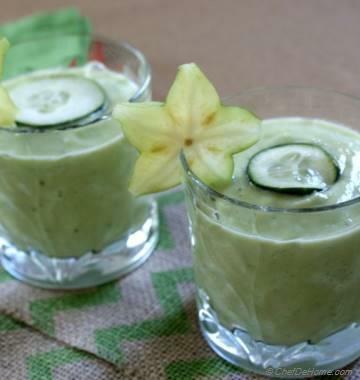 I mean, low-fat yogurt, garlic, herbs, spices, cucumber makes it a fit and refreshing dip! I consider Tzatziki Sauce the official healthy summer dip of 2017!! 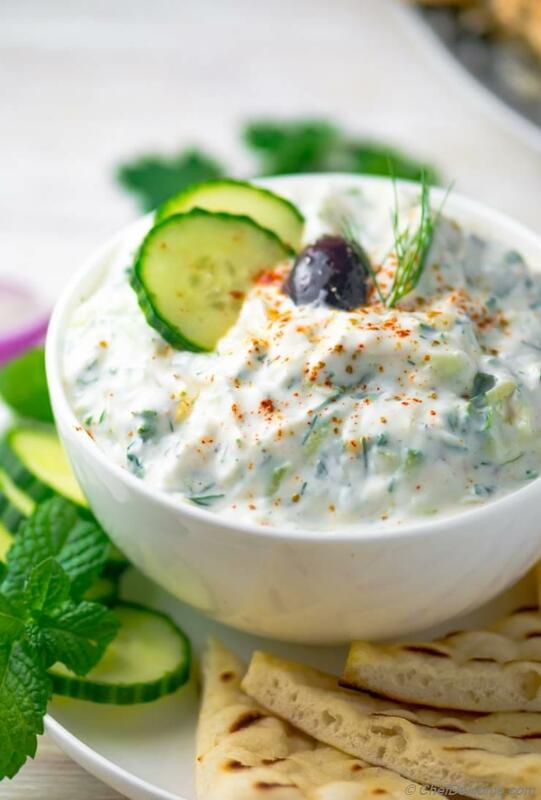 Serve it on side of grilled meats, or kabobs like I served it with Chicken Souvlaki, or serve it with veggies chips or pita... all dippers go great with this garlicky creamy tzatziki! So, let's make some Tzatziki [tsä'tseke]! Greek Falafel platter is my favorite menu item in Greek restaurants but I'm never so happy with a tablespoon serving-size portion of tzatziki. A plate of 4-6 falafels and 1 tablespoon tzatziki! Really? Why do restaurants cut-cost on sauces, the quintessential flavor makers!? Any ways.. honestly, I prefer to make a batch at home! Specially, when I make Mediterranean food at home, I never miss the opportunity to mix few cups of tzatziki sauce. Every one loves this sauce, hands down! I never have leftovers! If any, those work great as salad dressing, even as sauce in morning breakfast wraps. Once, one of our neighbor brought homemade tzatziki sauce in a community party. It was so delicious and herbaceous that I ate it with spoon (don't tell anyone or I will be not allowed in community gatherings)! ;) She also told me that original tzatziki recipe often has more herbs, and may or may not have lemon juice. Restaurants mostly add dill leaves because that is most common flavor contributor after yogurt, garlic, and cucumber... Since then, I often add some fresh mint (whenever available), dill leaves, and even some chopped parsley in tzatziki. I skip lemon juice or add less if yogurt is very tart. To make tzatziki sauce, I grate hothouse cucumber on coarse grater (you can also small dice), wrap it in muslin cloth and squeeze out as much water as possible. This step is important otherwise tzatziki will get watery very quickly. I then mix Greek thick yogurt with fresh chopped herbs, tzatziki seasonings - garlic, lemon juice, salt and black pepper... then fold cucumber in it. I also add hint of cumin powder and cayenne for more depth of flavor. 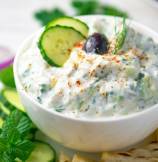 Tzatziki sauce should always be served chilled which makes is perfect healthy summer dip. Chilling also brings out flavor of dill and garlic in yogurt. If serving next day, I highly recommend adding salt 15-20 minutes before serving. Note: Always drain any water on top of yogurt. And use only thick Greek-style yogurt. When I shared Chicken Souvlaki yesterday.. 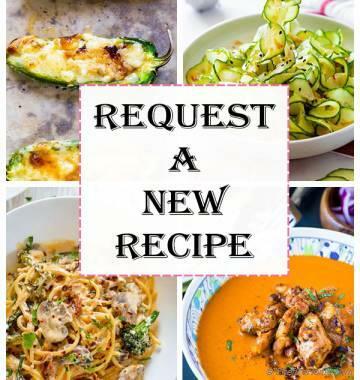 I wanted to add recipe for tzatziki too but decided to share a separate post. Two reasons: first because chicken souvlaki is dairy free. So I wanted to keep recipe dairy free. 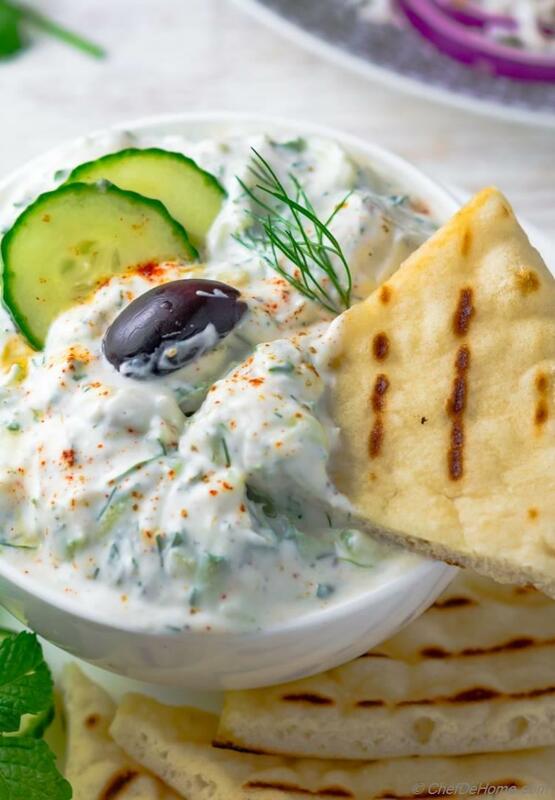 Second, tzatziki is not just a side, it is a complete robust sauce of it's own. 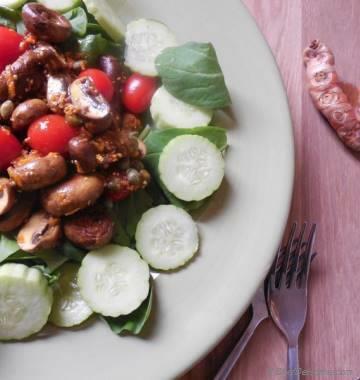 It can be great option for vegetarian dinner with side of rice and grilled veggie kabobs. So tzatziki recipe gets it's own spot on CDH. :) It is also gluten free when served with gluten free sides/main course. On a side note, it's good to learn one new word in one day. Like yesterday, we learnt [soov-lah-ki]..
Today, [tsä'tseke]. Make sense, right? I will keep that a surprise.. but I promise it will be delicious! Total Time 10 minutes Prep Time 10 minutes Cook Time 0 minute Difficulty Easy Yields 3 Cups Serves 8 Notes No. of servings depends on serving size. 1. Grate cucumber, place in muslin cloth, and squeeze to remove as much water as possible. Transfer to a bowl. 2. In bowl, add yogurt, grated garlic, olive oil, lemon juice, half of cumin powder, half of salt, black pepper. Mix well. 3. Fold in cucumber, dill leaves, and mint leaves. Taste and adjust salt and more lemon juice (if needed). Sprinkle remaining seasonings on top just before serving! Refrigerate until ready to use. 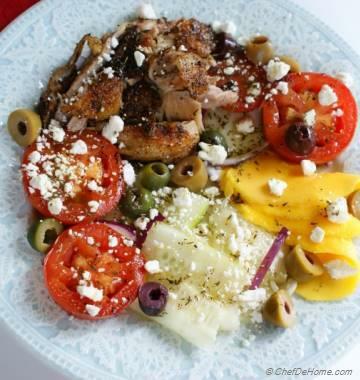 Serve with pita chips or on side of grilled meats. Enjoy! If using regular cucumber with seeds. Discard the seeds before grating. Seeds will not taste very appealing in Tzatziki and also it will dilute the dip as it sits longer. Hi there! I can't wait to try to make my own tzatiki sauce! Do you know how long it should keep in the fridge if I make a batch? Should it keep for at least a few days? Thanks! Hi Dara, sauce should be fine for about a day (refrigerated). It really does not get bad even after a day but cucumber start loosing water as it sits in yogurt and loose freshness. When planning to refrigerate for later use, don't mix in salt until ready to serve. This helps prevent water loss a bit. I hope it helps. Enjoy Tzatziki.